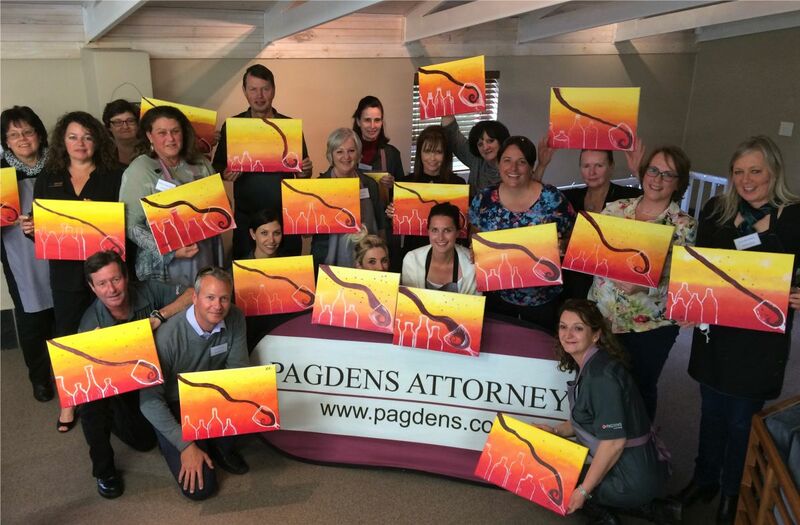 We offer beginners painting and wine classes, where you get to relax and lose yourself in something new and creative. Painting with Grapes is perfect for a date night, a moms night out, a birthday party or just because. 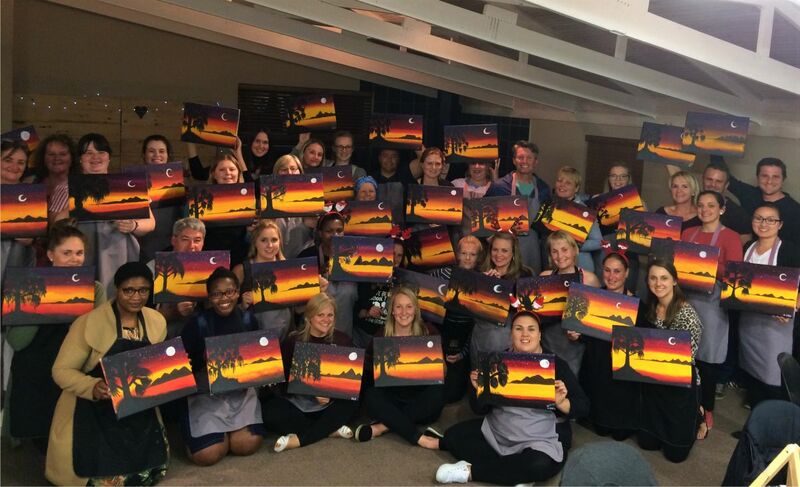 Each class includes step by step instructions and demonstrations on how to create your very own work of art as well as all the equipment needed to do so, even the wine. A qualified instructor will guide the class through every step of the way. From which brushes to use to colour mixing and paint application. All you have to do is follow and have fun. Each class runs for 2,5 – 3hrs. This includes the short interval in the middle where you will be welcome to help yourself to snacks and more drinks. Nothing, except a positive attitude and an open mind. We offer what we call an “Open Events” these are preselected classes where anyone is able to join, from individuals to small or large groups. Open Classes are an absolute blast, very lively and a great chance to meet new people who are also experiencing painting for the first time. These classes run during the week from our Painting with Grapes Studio and can be booked online via the “Bookings” tab. Forget the boring icebreakers and get to know your colleagues in a completely new way. 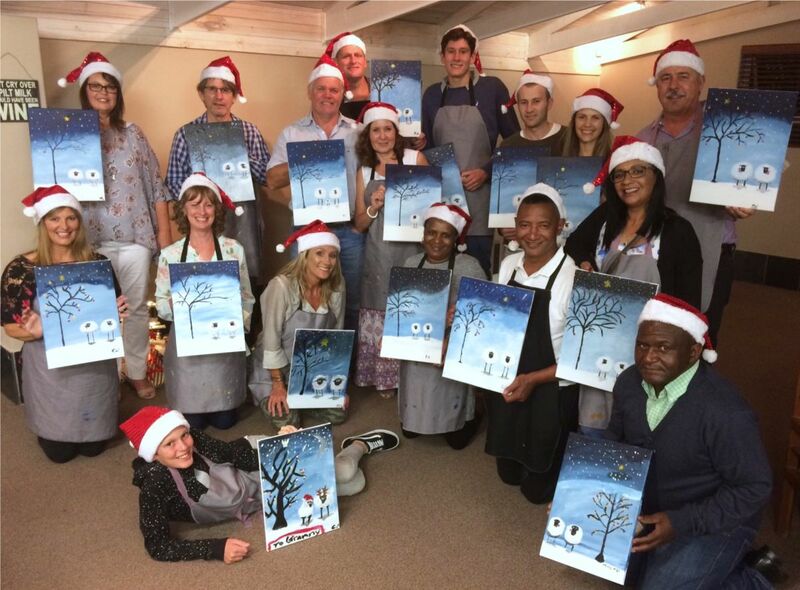 Staff Parties, Year End Functions, Team Building Workshops, Painting with Grapes is great for all. We offer tailored packages where you are able to pick and choose what you would like to add or remove from your Event with us. Impressing your clients and looking for something even more special? We can arrange fantastic Wine Tastings to go with your painting class. Taste and learn about different delicious wines while you work on your masterpiece. To find out more about our packages click on Learn More. Tired of doing the same old thing every year for your birthday? Or perhaps it’s your turn to host your Supper Club or Book Club? Why not try out a Painting with Grapes evening. Sip wine, chat and laugh with your friends while enjoying your very own private painting class in our PWG Studio or at any venue of your choice. We also do Bachelorette parties, Get Together groups, Children’s Painting Parties etc. Your Event can be tailored to your liking. so if you think London91 is for you send us your CV across, we’d love to hear from you.